Not posted of late as there was not much news to write about up to now. Chris and I went to visit Fernwoods on Wednesday to have our latest design meeting and see how things were progressing. 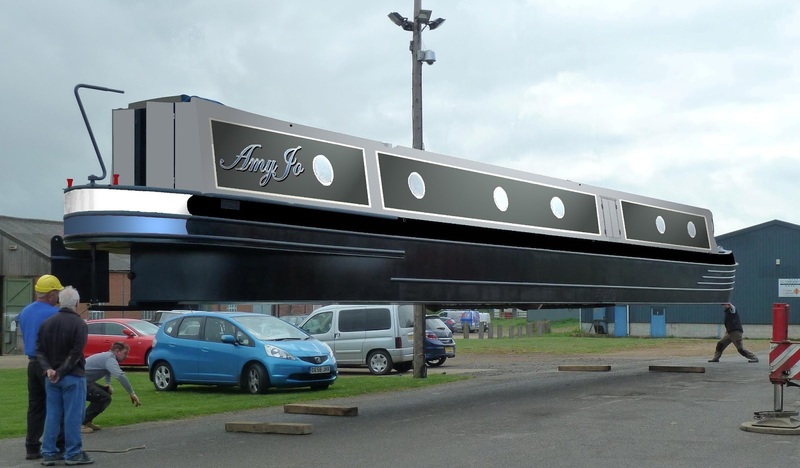 We spent the day finalising all sorts of things so AmyJo's fit out can progress. Meanwhile Chris and Julia were in deep discussions on finalising much of AmyJo's interior layout, fabrics and so on though Chris has a lot more homework to do for curtain/bung material before we can complete the styling inside. The colours scheme is now set for the wet room and fittings chosen apart from sink and tap. Throughout the day our list of things to think about and to buy was steadily growing. We discussed our electrical need in particular our need to have internet access and the power consumption that would entail. We are settling on an M2M 3g/4g router with wifi coupled to external antennas. This means when in range we can use local wifi hotspots and when out of range use the 3G to connect. The router is spec'd so when 4G becomes more readily available we just need to change the SIM card and we're done. We also have to think about TV, Washing Machine, tumble dryer to remember but a few. We'll post more on these as we get them. All the outlets for the sinks, washing machine and so on have been installed. The engine bed and surrounding area has been under coated in dark grey. Chris and I got to stand inside AmyJo and here Chris is standing roughly where the wet room will be. Looks extremely long here but when the bulkheads are in that will make things look different. I had a comment from Anonymous on my last post (I do not publish if you don't leave a name), they were concerned the spray foam looks inadequate. Whilst aboard this time I was able to check the depth and am happy to say its more than enough. 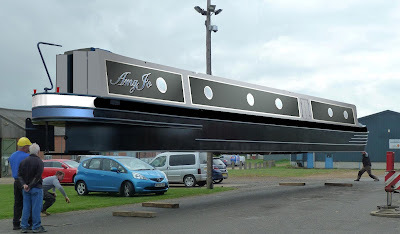 AmyJo's hull ribs and cabin side struts are quite large at my request to give extra strength and is why the foam looks at though there is not enough. Not much more has been done outside but AmyJo's roof has now received the anti slip surface and a coat of undercoat on that. Now we have finalised the livery The outside painting can progress much further. The other boat in the picture is Fernwoods latest creation called Dubel Dutch owned by Martin and Annmarie. As you may have guessed they come from the Netherlands hence the name. Dubel Dutch is nearing completion and is looking pretty smart with some fantastic artwork by Andy Russel. Look out for her on the cut in the next month or so, she looks stunning. We will be visiting again and of course will let you know how things are progressing. Hi to you both. Wow she is coming a long a treat. I can imagine how excited you both are and loving all the preparation for the fit out etc. It is great fun working out where things will go and what items to buy. Yes really exciting and giving us both sleepless nights in a good way thinking about how we want things done. We're so excited and having a great time looking for things we need to buy to put in AmyJo. So sorry to hear Keith's back is playing him up again. Do hope it improves soon. I know how painful that can be.